Kevin James Ltd (KJL) have been providing bespoke software and security solutions to the construction industry for over twelve years. 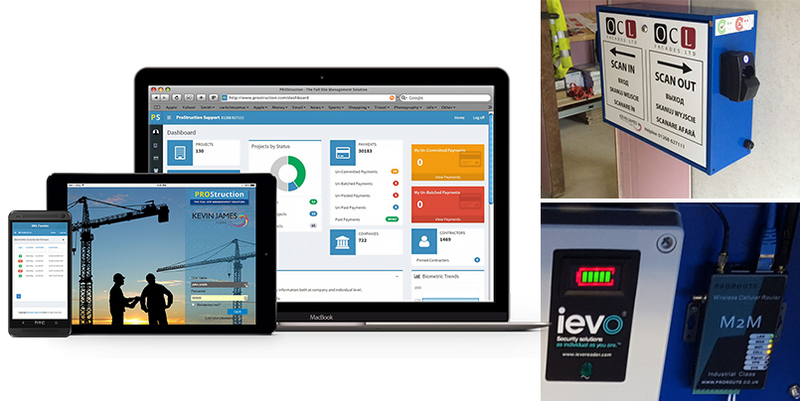 Their new Mobile Workforce Management Solution, PROStruction, is fully integrated with the ievo ultimate™ biometric scanner using the ievo custom kit and ievo enclosed power supply. The advanced software solution utilises multispectral imaging (MSI) technology to: validate contractor and sub-contractor documentation and clearance for work; automatically generate time-sheets and perform real-time site roll-calls; and deny access or flag a critical issue at multiple site locations via a yellow and red-card system. OCL Facades approached KJL with the task of adding a range of new features to their existing contractor management software. The updates would mean transitioning from an automated payments and contractor administration tool to a cutting-edge Project and Workforce Management Solution. The idea was to create a platform which actively promoted industry best practices throughout various areas of the business, while offering real-time security and insurance checks by leveraging our advanced biometric scanning technology. The client also had requirements for mobile connectivity (for onsite deployment and regular location changes); a highly robust equipment setup capable of operating properly in a variety of conditions; and multiple site access control with real-time monitoring and management reporting. Bringing all of these features together would set a new industry standard for how to effectively manage an external (contractor and sub-contractor) workforce, bringing significant updates to project management, site security and insurance validation for the UK construction market. Having identified 4G cloud based technology as the most secure method of allowing multi-site management from a single network, the next stage was to find a robust biometric solution that would; a) operate effectively in dusty conditions, b) offer complex integration with bespoke software, and c) provide reliable and consistent data readings to ensure the system was fully effective. Following live demonstrations, where the ultimate biometric scanner was fully tested under similar working conditions to on-site locations, the ievo team worked alongside KJL to integrate the biometric solution into their SaaS platform. The two teams developed a fully secured biometric network which was capable of managing the full range of operational and site management requirements. Part of the deployment model was to build biometric scanning stations that were both weather proof and mobile, allowing the solution to be moved from site to site as required. Two key concerns, both of which would directly affect operations, needed addressing. The primary concern surrounded inconsistent network connectivity; with a poor internet signal, workers would not be able to use the scanning stations. To combat this, the solution was designed to use extremely low bandwidth, with the ability to function properly from a weak 3G connection. To do this, the ievo biometric scanner was configured to take highly accurate readings, while minimising the transmission of data. The ievo master controller was essential in this process, allowing for storage of encrypted biometric scan templates, greatly reducing the data packet size required to validate user identity, ensuring proper access control even in locations with extremely bad mobile connectivity. The second concern was based on the solution needing to operate not only in harsh conditions commonly associated with construction sites, but also in locations which experience regular power fluctuations and outages. The ievo ultimate biometric scanner matched this need perfectly, and the optional enclosed power supply provided surge protection and long-life battery, capable of running the scanning stations (in regular use) for up to three days without charging. Using ievo technology, ProStruction met a number of key requirements which would simply not be possible with any other biometric technology. In addition, the ievo hardware setup ensures that the system is self-contained, meaning there is no need for third party hardware, providing an additional layer of security. This ground-breaking Mobile Workforce Management Solution has been extremely well received within OCL Facades and has seen great success from its phase one rollout. The solution is leading the way in what’s possible with advanced biometric scanning technology in the construction industry.